You are supposed to be thrilled when you get your new iPhone, aren’t you? Wait a minute. 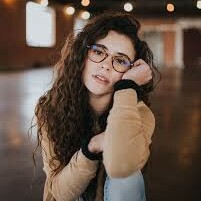 I guess I might know how you are going to react the next moment after your joy. What am I going to do with transferring so much data from Samsung to iPhone? (Here I assume your old phone is Samsung). What a nightmare it is. I get it. But you can throw all your concern away right now because you have come to the right place. 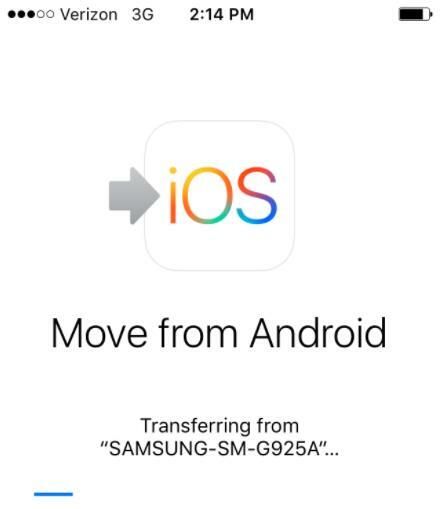 Right here you are going to get three different ways to transfer videos from Samsung to iPhone. You can easily distinguish the best one on your own. 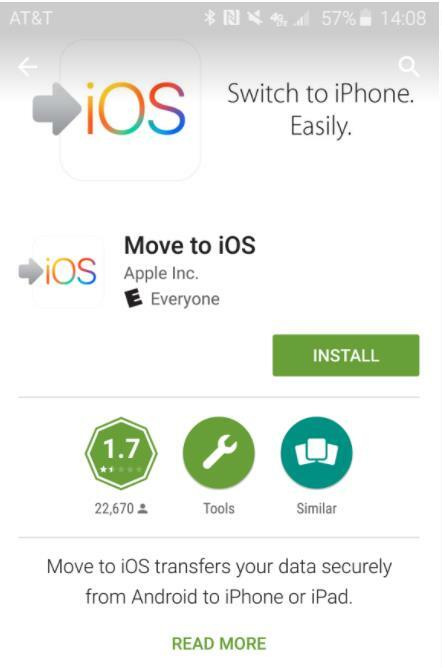 “Move to iOS” app is a tool designed for transferring by Apple and you can download the app from Google Play. It can get all your data transferred from Android to iPhone. Follow me to see how to send video from Samsung to iPhone. 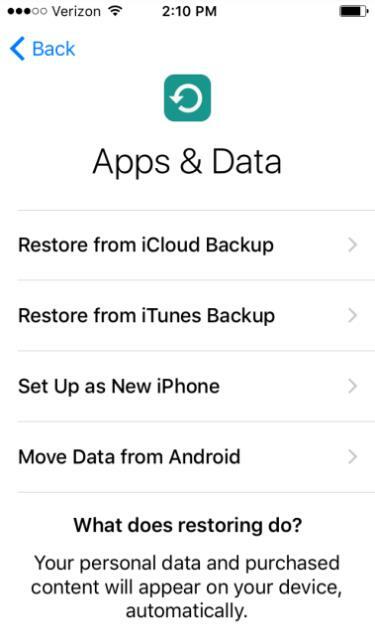 Step 1: If your iPhone is a new one, just get started with the process of “Set up your iPhone” and then slide to the screen named “Apps & Data”. 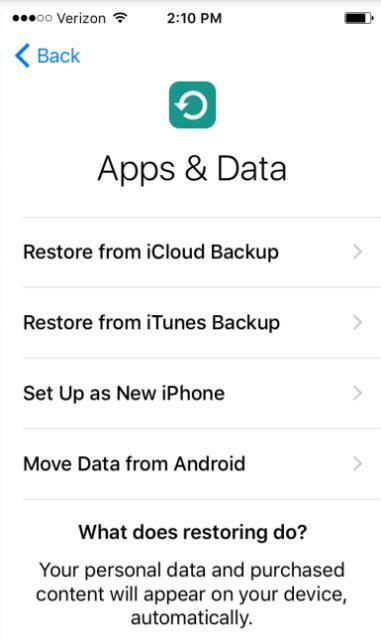 If you have been using this iPhone for a while, you have to erase your iOS device in order to reach the screen of “Apps & Data”. 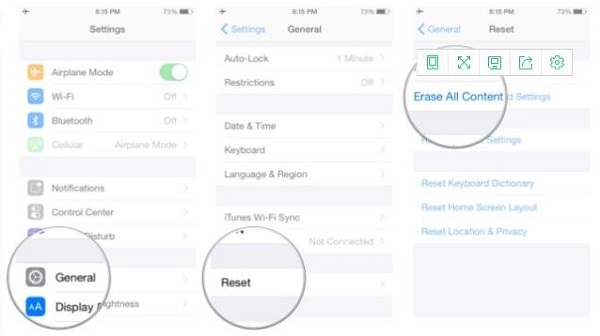 Get your iPhone and choose “Setting > General> Reset > Erase All Content and Settings”. 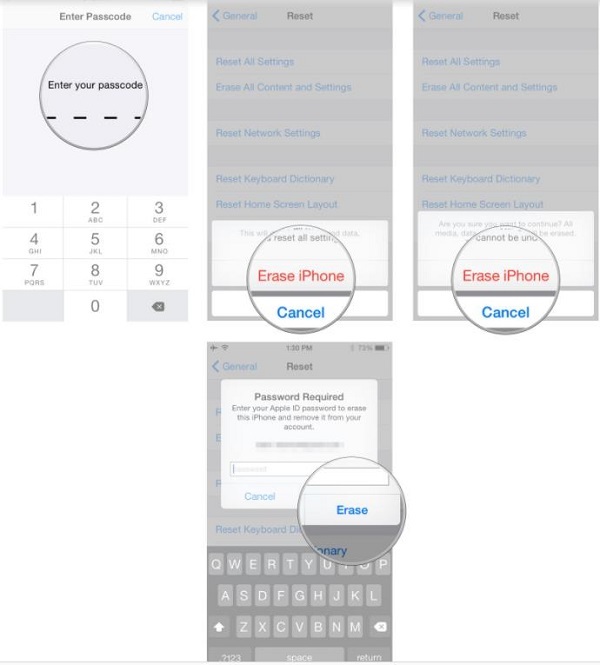 Enter your iPhone password and then choose “Erase iPhone”. Enter your apple password in the pop-up window and then choose “Erase”. Now you have completed the preparatory work. Let’s move to the next step. 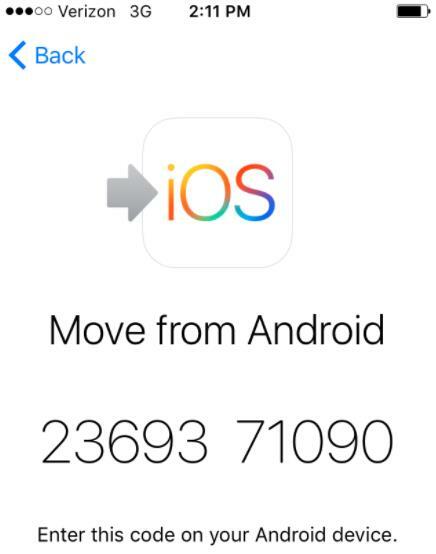 Step 2: Tap “Move Data from Android”. 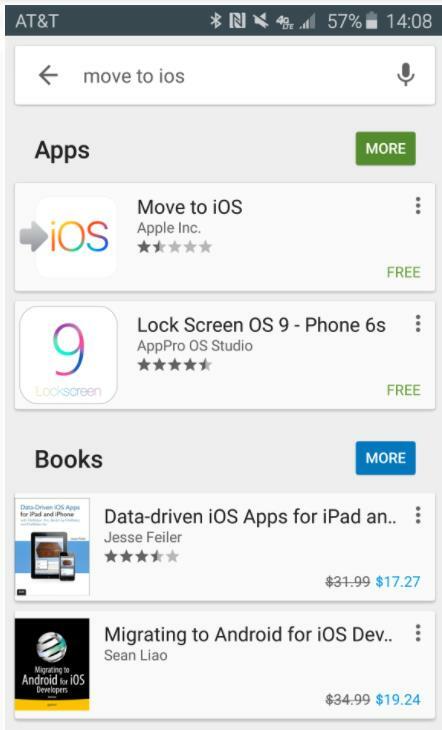 Step 3: Get your Samsung cell phone to open “Google Play Store” app, and then you need to search for “Move to iOS” app. Step 4: Tap “INSTALL” and then tap “ACCEPT”. 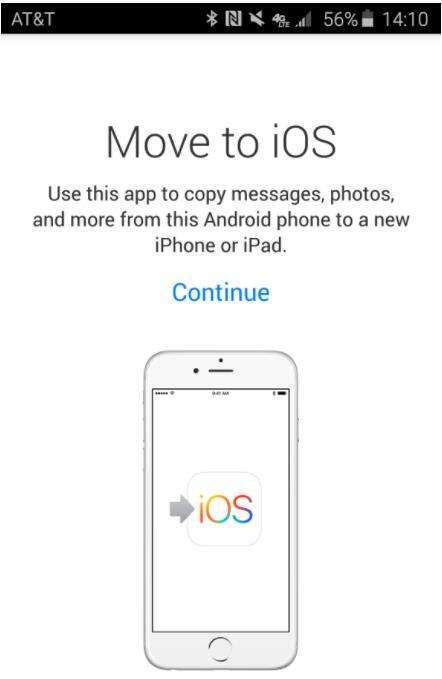 Step 5: After you open “Move to iOS” app on your Samsung cell phone, you will find the screen below in front of you. Tap “Continue”. Step 6: Tap “Agree” showed on the “Terms and Conditions” screen. Then choose “Next” on the upper right corner of the “Find Your Code” screen. Then the “Enter Code” screen will appear. 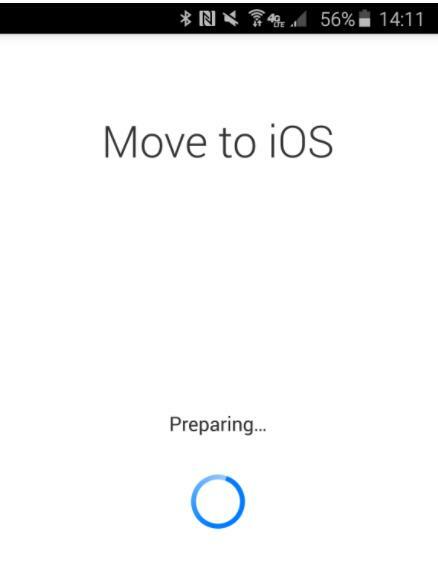 Step 7: Move to your iPhone and tap “Continue” on the “Move from Android” screen. Then wait for a string of code to appear. 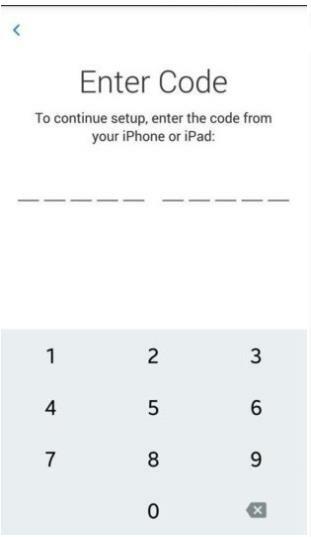 Step 8: Get your Samsung to enter this code displayed on your iPhone. 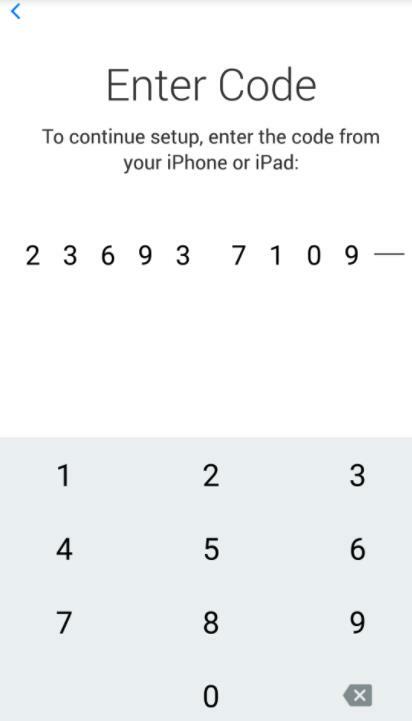 Step 9: After entering the code, your Samsung cell phone will be automatically connected to the same Wi-Fi of your iPhone. Choose what you want to transfer displayed on the “Transfer Data” screen. 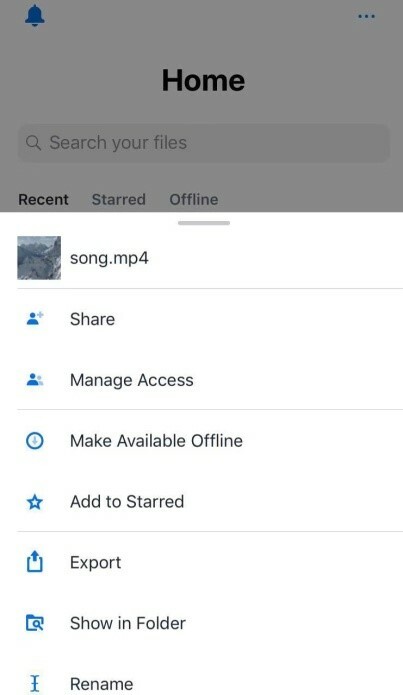 In order to send videos, you need to choose “Camera Roll” and then choose “Next” on the upper right corner of the “Transfer Data” screen. Step 10: Wait for the scroll bar moving forward until the transferring is completed. 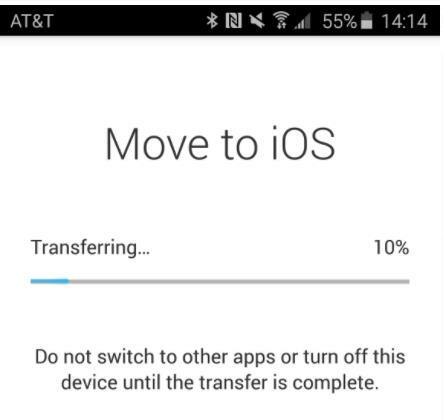 Step 11: Once the transfer process is completed, you need to continue setting up iPhone. When the setup is done, the notice showed on the pop-up window will lead you to enter the password of the Google account with which you have transferred the data before. OK. There you go. iTunes is an iOS data tool by Apple, too. You can sync your music, videos, contacts, and files among your iOS devices. Let’s take a few minutes to learn how to send video from Samsung to iPhone. Step 1: Connect your Samsung cell phone to your computer with USB cable. Step 2: Select the video you want to transfer and copy them to the destination folder in your PC. Step 3: Open iTunes and then choose “File > Add File to Library”. Select the video which you copied to your computer to transfer them into iTunes library. Step 4: Connect your iPhone to your computer. 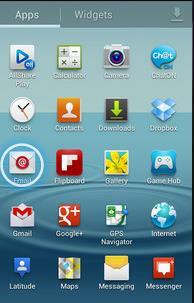 Then you will see the phone image icon which the arrow points below. Step 5: Click the phone image icon and then click “Movies” on the left side. And then check “Sync Movies”. 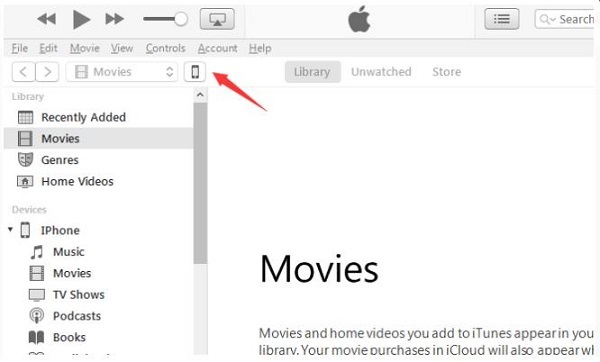 As you can see, the video you added to the iTunes library before is in the “Movies” area. Select the video and then click “Apply”. That’s it. OK, having getting acquainted with the two ways introduced before, you may be getting tired of those unhandy means. How do you really feel about those two ways on how to send video from Samsung to iPhone? Actually, I can image how frustrated you are right now. 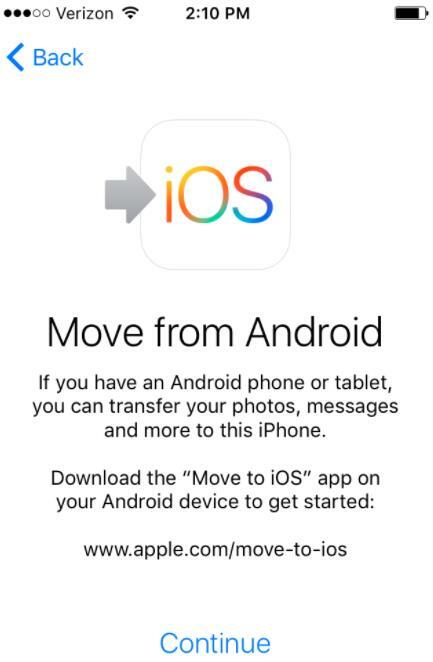 The way using “Move to iOS” app is like the most annoying way ever. I guess you could hardly stand those steps which can easily piss you off. 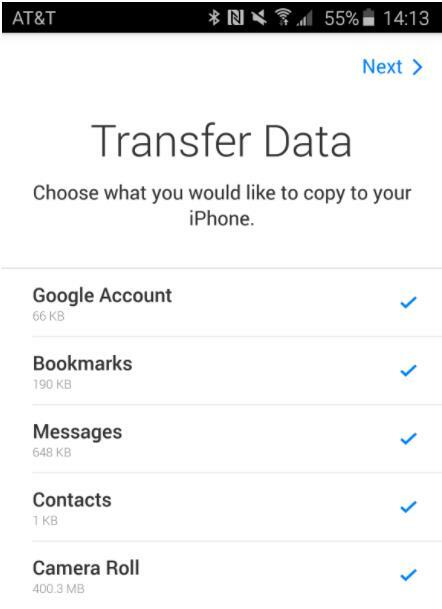 Let alone you have to erase the existing data on your iPhone to transfer if you’ve used it already. Of course, iTunes can be a choice as well. But to sync iTunes with your iPhone is a quite time-wasting job as well. There is another way to share your videos by treating them as email attachments. All you need is just an email account. Now let me introduce some steps to make you get to know this simple way. Step 1: Launch Email app on your Samsung. Step 2: Click the attachment icon to add your video. 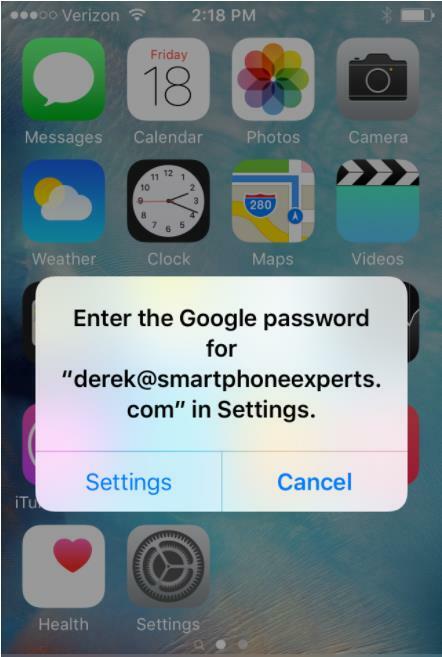 Step 3: Enter the receiver address which is the default address you set up for Email app on your iPhone. And then choose the Send icon marked below to send your email. Step 4: Now turn to your iPhone. 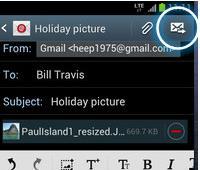 Click Mail app. Step 5: Open the email which comes with the attachment you just sent. 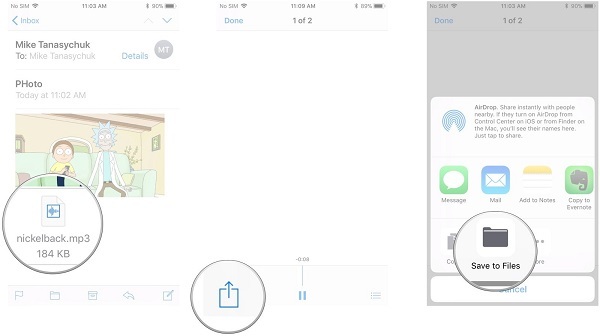 Step 6: Make a long press on the attachment until the Share icon shows up. Step 7: Click the Share icon and then choose "Save to Files". As a creative handy tool, Dropbox can bring you a totally collaborative space where you can sync your data just with one click for good and without even a little data loss. You can get a basic account with 2GB storage for free and then decide whether to pay for the upgrade account for more functions on your own or not. Just get these four steps, then you will get the most out of this tool. Step 1: Go the official website to log in with your Dropbox account. As you can see below, choose "Upload > Files". And then select the video you would like to share to upload it to your Dropbox space. Step 2: Turn to your iPhone. 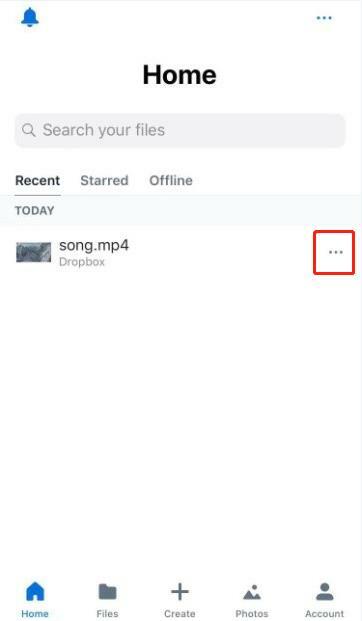 You can download Dropbox app directly from App Store and install it on your iPhone. Log in with your Dropbox account. Launch Dropbox app. The video will be automatically synced to your iPhone. Click the share icon beside your file marked in red. Step 4: Click "Save Video". This is how to transfer video from Samsung to iPhone via Dropbox. With Dropbox, you can easily sync your files among almost every device. Check and access all your files right from your iOS devices or your desktop. Well, now you are going to get the point of this article, which is the best and most time-saving way ever to transfer your videos. Leawo iTransfer is a wonderful iOS data management tool. It can make your transferring among different iOS devices extremely efficient. With just a few moves, you can perfectly take care of transferring any kind of data among any devices safely and easily. And you don’t have to erase your existing data, which brings you’re the biggest convenience. Now let’s get to know how to send video from Samsung to iPhone. Connect your Samsung cell phone to your computer with USB cable. Then select the video you want to transfer and copy them by pressing “Ctrl + C”. Then pressing “Ctrl + V” to paste them to your destination place. 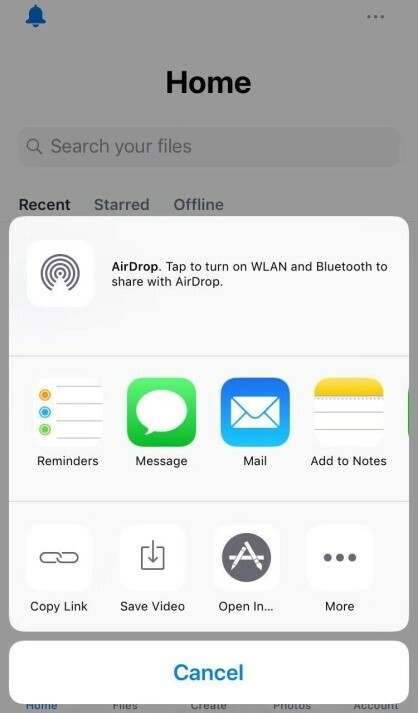 Simply download Leawo iTransfer from https://www.leawo.org/itransfer/, and then connect your iPhone to your computer and open Leawo iTransfer. Your iPhone will be automatically scanned. 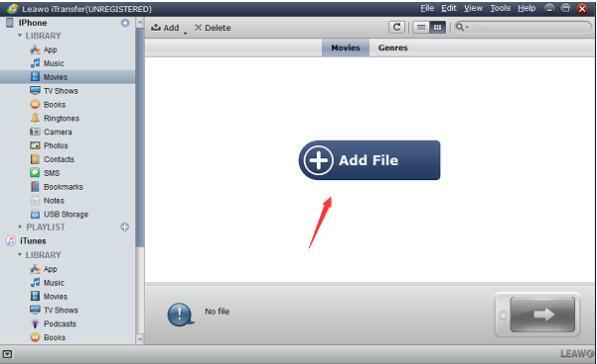 Tap “iPhone > LIBRARY > Movies”, then choose “Add File” displayed on the right side. Choose the video which you copied to the computer and then click “Open”. OK. That’s it. All you need to do is only a few steps, and it couldn’t be simpler. Leawo iTransfer is designed to be easy and suit for everyone. Being easier means more expensive. You get it? Once you take a shot on Leawo iTransfer, the time it’ll help you save is far more than you could ever think. Just image the moment you are enjoying a cup of coffee, while your friend is struggling with his data transfer.